commercial possibilities — but before Otto Messmer's Felix the Cat proved it was capable of fielding a breakout hit. J.R. Bray's Paramount Pictograph film magazine was a pioneer in the animation business. It was delivering cartoons to theatres on a dependable basis within a couple of years of Gertie's debut. Many of animation's early moguls got their start at Bray — men like Paul Terry and Walter Lantz. Max Fleischer was among Bray's most illustrious graduates, contributing an innovative little series called "Out of the Inkwell". Koko (sometimes spelled "Ko-Ko") was its star, debuting in a one-minute 1916 outing called, simply enough, Out of the Inkwell. Koko was the first toon to be rotoscoped, with Max's brother, Dave, acting out the Clown's part for animators to trace. The character wasn't rotoscoped all the time, however, as the process proved not quite the labor saver Max, who invented it, had hoped it would be. Koko was also the first to mingle on-screen with the real world — starting with his emergence, at the start of each cartoon, from a photo of an actual inkwell. The Disney outfit made quite a name for itself doing the same sort of thing, from the clever experiments of the early 1920s "Alice" comedies to the incredible sophistication of Roger Rabbit — but it was Koko who did it first. When the Fleischers moved out of Bray and formed their own studio, Koko remained their star. 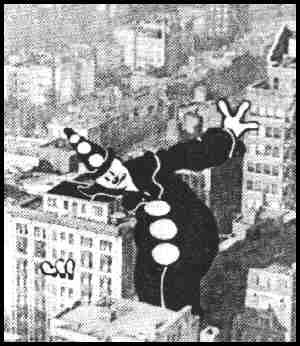 In fact, he continued to star in new cartoons for the remainder of the silent era. Even when sound came along, and the same studio's Betty Boop eclipsed him in fame, he continued to appear frequently as one of Betty's supporting characters. He was used less frequently in that role as the 1930s wore on, tho, and by the middle of the decade he was practically gone. But not quite — he managed to stagger to the screen as late as 1949, in the Famous Studios Screen Song Toys Will Be Toys, in which a doll in his image (as well as one of Popeye) came to life. Possibly Koko's best-known role was as back-up to Betty Boop in Snow White, which came out March 31, 1933 (more than four years before the Disney version). In it, the Clown lip-synchs to Cab Calloway's "Saint James Infirmary", while morphing into various objects mentioned in the song. Since Koko was mostly a silent star, it's one of the few classic-era cartoons in which he had any voice at all. Koko got a new lease on life in 1955, when Paramount Pictures, which by then owned the old Fleischer Studio's assets, sold his cartoons to television. The silent ones were of little use in that venue, but his 1930s appearances with La Boop were quite viable — at least, as long as black and white cartoons were broadcastable, after which he faded into limbo again. Koko's last gasp came in TV's 1961-62 season, when a new series of "Out of the Inkwell" cartoons was made for syndication. In this one, character actor Larry Storch, whose animation credits include a couple of minor Looney Tunes characters of the 1960s such as Cool Cat and Merlin the Magic Mouse, provided the Clown's voice — and those of most other characters. Koko had a female counterpart, Kokette, and a dog, Kokonut. Max Fleischer, still alive and pushing 80, was said to be displeased with the quality of its animation. Today, it is mercifully forgotten. Koko's old films, however, remain — dated, seldom seen, and compared to modern technology, more than a little primitive. But they can still be found in video bargain bins and out-of-the-way cable stations, and are still cherished by those who love creativity in cartoons. Text ©2001-07 Donald D. Markstein. Art © Max Fleischer Productions.